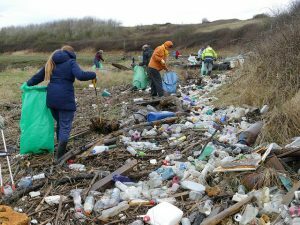 50 volunteers gave up their Easter Saturday to tackle one bend on the River Rhymney that had collected thousands of plastic bottles and lots of other waste. 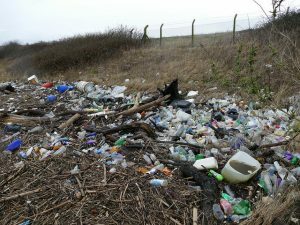 This section of the river had never been cleansed before and volunteers were shocked by the sheer amount of waste present. 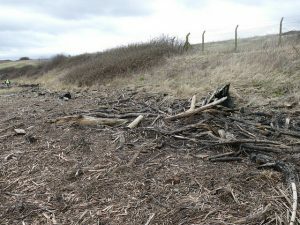 However, in less than 2 hours, the team of litter locusts completely cleared the area! They collected 150 blue bags of plastics for recycling by Terracycle (will be made in to new shampoo bottles) and 6 builders sacks of large plastic items; 4 barrels, 8 traffic cones, a chair, table top, 25 bags of mixed recycling, 10 car wheels/tyres, 14 gas bottles, 2 fire extinguishers, 2 fridges, 2 fridge freezers, 60 bags and 5 builders sacks of general waste for incineration. They also collected 10 eight-foot building crash mats filled with polystyrene, 2 containers of engine oil, a ladder, a gigantic water bowser, and 2 bags of footballs! Nigel Barry, committee member said, “There were so many new faces today, loads of them! I can’t help thinking that the Blue Planet program is continuing to change people’s attitudes and Cardiff Rivers Group are in the thick of it. We better brace ourselves for larger numbers of volunteers. It is great to see so many people caring for their environment”. “Saying that, today was a great example of what you can achieve in partnership. We were absolutely delighted by the response from the people of Cardiff who turned up to help. 50 volunteers is a huge number and they all worked extremely hard indeed! The site was completely cleaned in under 2 hours – what an achievement!” she added. Waste was ferried back to Lamby Way for recycling by Cardiff Council. Thanks to Natural Resources Wales too who bought the group some new litter-picking kit. It arrived just in time. 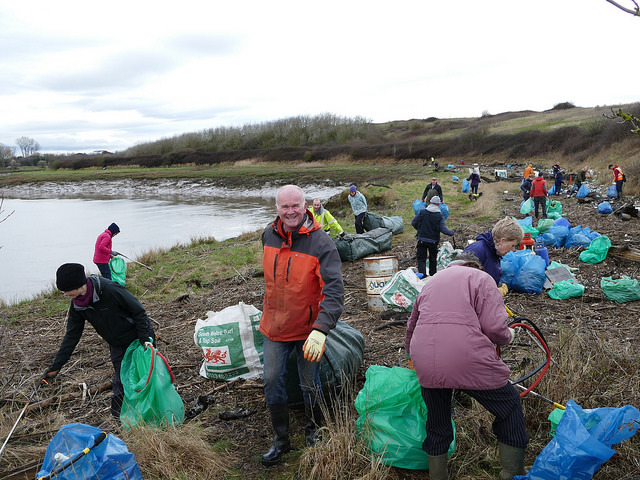 The event was held as part of Spring Clean Cymru arranged by Keep Wales Tidy (it was originally scheduled to be held on 4th March but had to be rescheduled due to Beast from the East). For more information, or to join in with future events please visit our website http://cardiffriversgroup.co.uk/ or social media feeds.